California Poppy 'Mission Bells' is a cheerful addition to the summer garden. The semi-double flowers bloom in orange, yellow, gold, pink, red and white. The flowers open with the sun and close when it's dark or cloudy. Eschscholzia californica is native to the western United States. The colorful flowers attract beneficial insects. California poppy is an annual wildflower that blooms in a wide range of colors. It is drought-tolerant, and it prefers well-drained soil in full sun. Sow California poppy seeds outdoors in spring or fall. Sow on the surface or barely cover the seeds with soil. Easy to grow. California Poppy 'Carmine King' has carmine-rose flowers with creamy white centers. The plants are relatively short, making them a good choice for small gardens and containers. Carmine King California poppy is an heirloom flower that first appeared in garden catalogs in 1931. California Poppy 'Golden West' has large, golden-yellow flowers with orange centers. The blue-green, ferny foliage is also attractive. Golden West California poppy is an heirloom variety that was introduced in 1907. It is drought-tolerant and easy to grow. California poppy 'Purple Gleam' blooms in early to midsummer with unique, lavender-rose flowers that have satiny petals. Purple Gleam California poppy is nice for cutting. Cut the flowers in the early morning before the petals unfurl. California poppy 'Red Chief' is a stunning selection with fiery, tangerine-red flowers that bloom for a long time in summer. Red Chief California poppy tolerates heat and drought, and it reseeds nicely. Deadhead the spent blooms for extended flowering. California poppy 'White Linen' has creamy white flowers with silky petals. The blue-green, ferny foliage is also attractive. White Linen California poppy goes well with many other flowers in the garden. It is drought tolerant and deer resistant. California poppy 'Ballerina Mix' has double and semi-double flowers in a wide range of colors including yellow, orange, scarlet, rose, lilac and white. 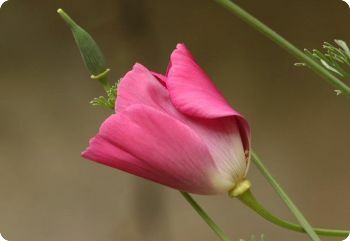 Ballerina Mix California poppy has crimped or fluted petals, which give the flowers a frilly appearance. It makes a lovely groundcover.